Ga to Gl Click on "Up" to go back. 1974 This is a 1917 'photo of "Telegraph Hotel" Goodooga from www.pictureaustralia.org.au via Geoff Chapman. 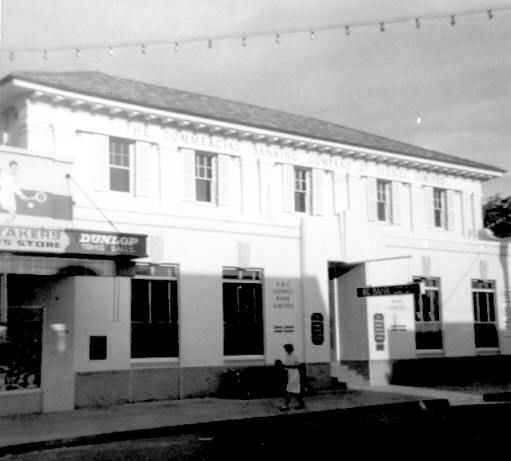 It was virtually unchanged, when, in 1959 Harold Lee rented 2 rooms (On the R/H rear part of the building) to provide the Bank's presence in the town. 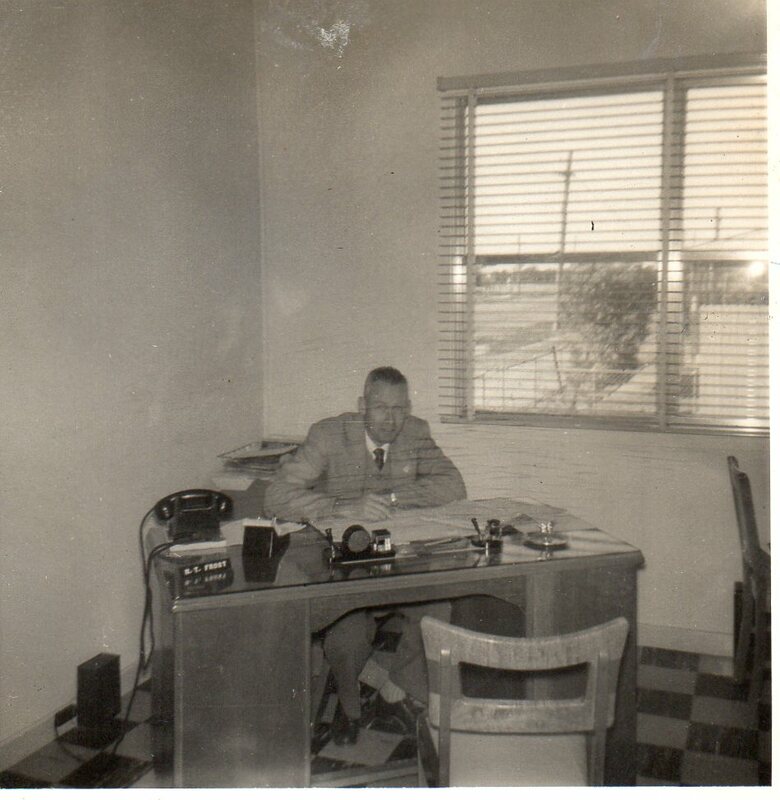 Advised by past Manager Richard McCredie and confirmed by Kevin Nicol who says: "I remember Harold Lee telling me that he was instructed, while auditing at Brewarrina, to proceed to Goodooga to open a branch. He said he arrived and arranged to rent space, a table and a couple of chairs but before he could set up, they had to clear the room out. Apparently, a bullock had been dressed in the room the night before, so you can imagine the mess. I'm almost sure Harold said the head, hide and hooves were still in one corner of the room. Anyway, "The Dardenelles" as it was known, was our first location in Goodooga." 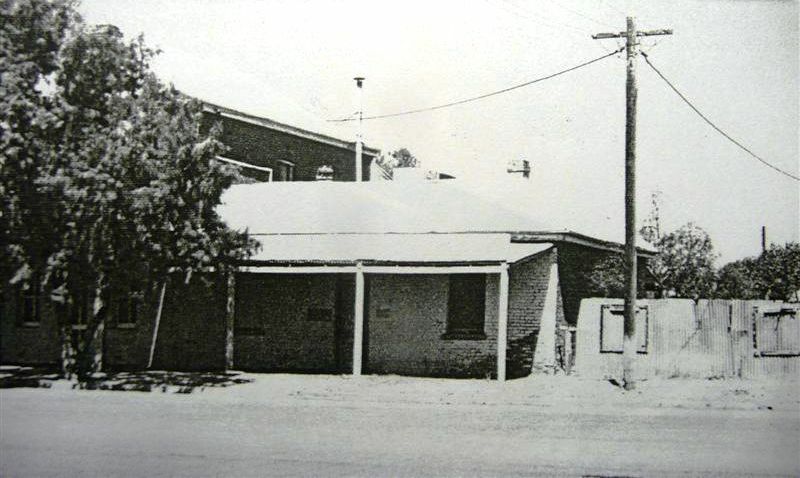 1959 July 24 board decided branch would open ASAP with Brewarrina Manager proceeding immediately to secure premises & a building block & to announce the opening, with supplies arriving at Brewarrina via airfreight. 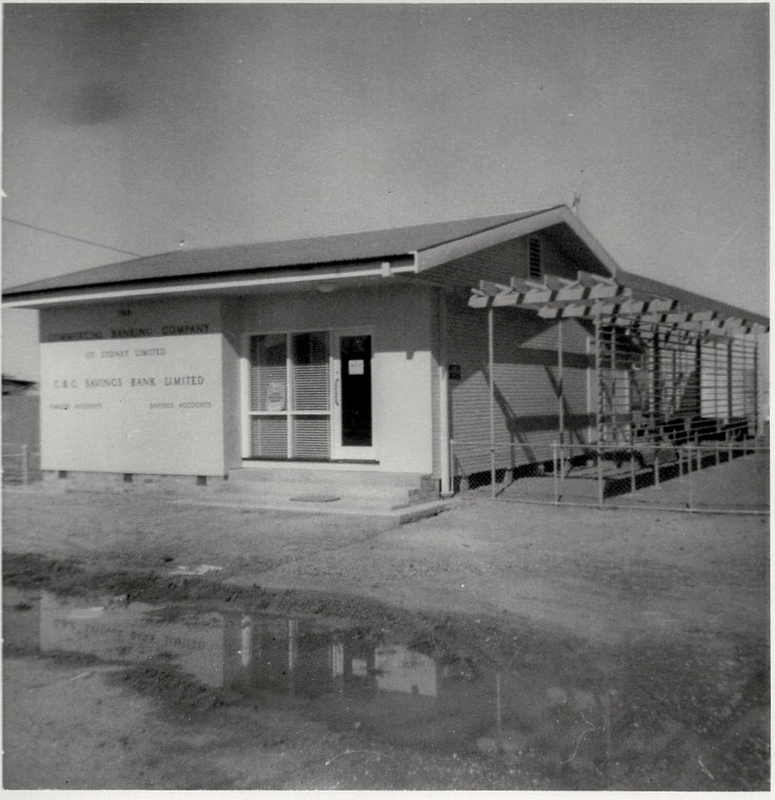 1959 July 31 CBC Goodooga branch opened to protect valuable Goodooga business previously held by CBC Brewarrina. 1960 the premises were erected at a cost of 12,500 pounds. Goodooga Managers have included:- opened by Harold Lee, FL Drury (Current Accounts July 1964 p10), Kevin EJ Nicol 1967-69 (photo in Current Accounts Jan 1968 p42), RM Hawke, 1973 Dennis W Malligan who was Manager Goodooga during the biggest floods ever to hit Brewarrina in January 1974, with Richard N McCredie (Current Accounts Jan 1975) being the last Goodooga branch Manager. When Goodooga branch closed, Richard became Manager Trangie. 1968 Kevin Nicol's photos of his first branch 1967-69. Top photo shows customer parking area after a shower in 1968 and the lower photo was taken in 1968. "There never was much in the village but there is B–ALL there now." 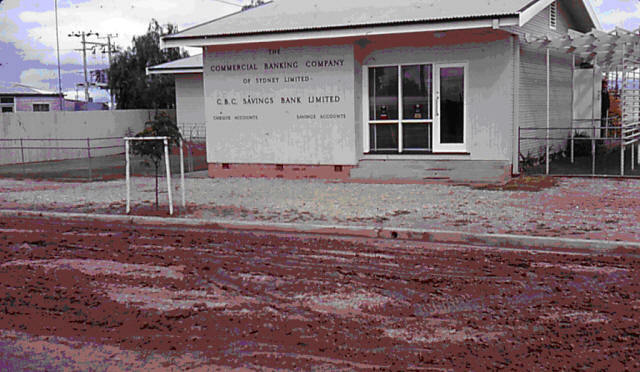 2013 May David Jobson supplied this photo of the first building occupied by the Bank in Goodooga, taken in 1974. 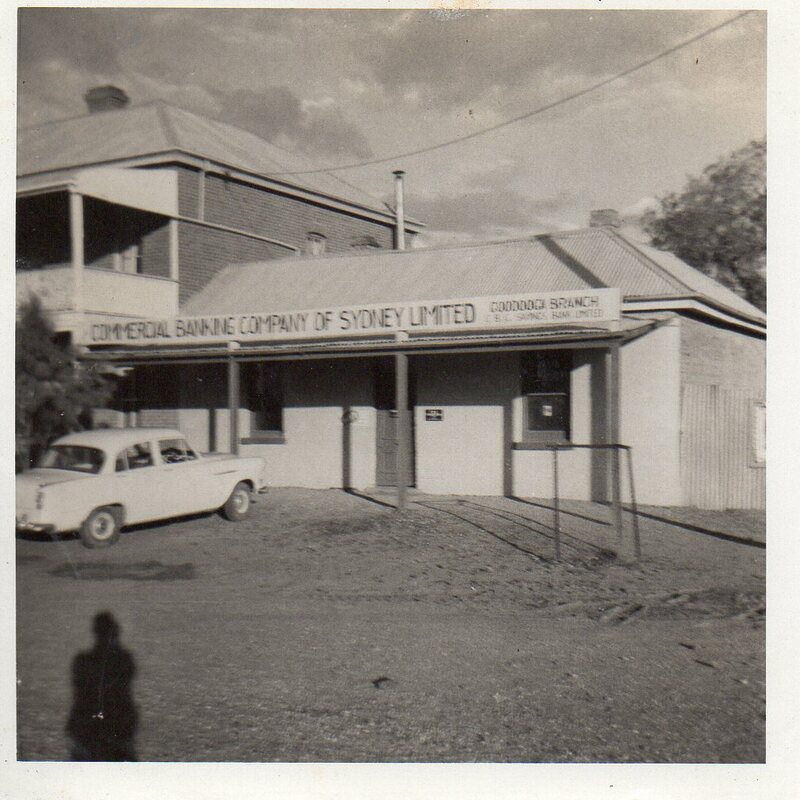 "Here’s four pictures of the new branch at Goodooga NSW in 1960 sent to me by Kerry Bridge. Kerry is an old friend and colleague of mine from our banking days and was working at Goodooga in the 1960s. Not the best quality photos but another important insight into our history. 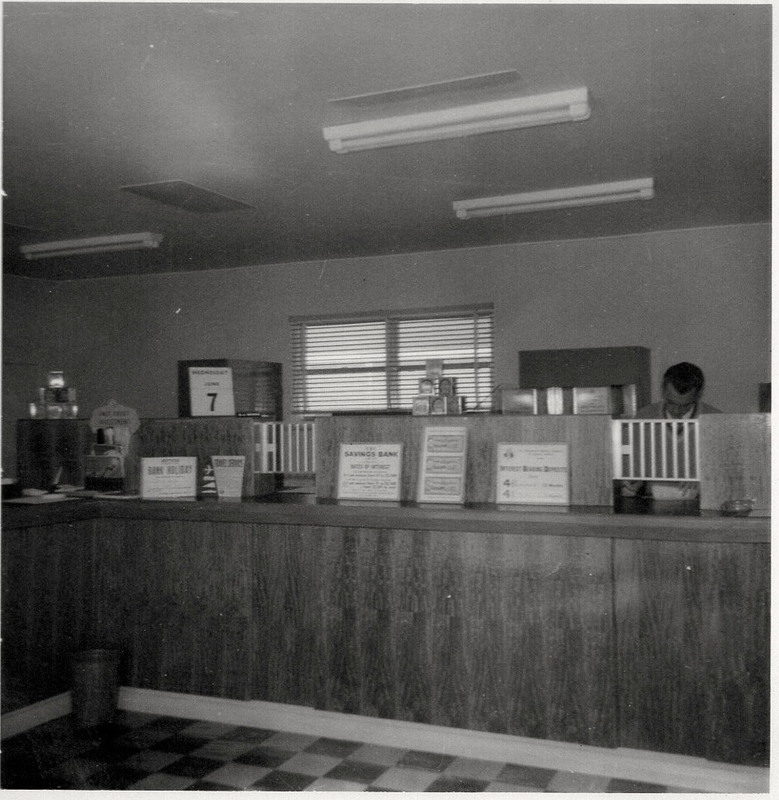 The photos are all from 1960 and are 2-the new branch 3-the counter 4-the office area. Note the old banking tools we grew up with in this days! In the customer area: stacked money boxes, an ash tray and an interest rate sign with rates of 4.5%. And in the work area the Burroughs statement machine and statements in the tray, the hand ledger and machine slips filed on spikes, and blotting paper pad on the tellers counter. I’ll bet there was a sponge to count the paper notes there somewhere too. I liked the statement machine operators chair, a classic! All pretty neat in that area as the branch was new." Helen Cadzow, Historical Services Manager, NAB said "Thank you David, the pictures are wonderful, as they tell the story of banking in a country branch in the 60’s." 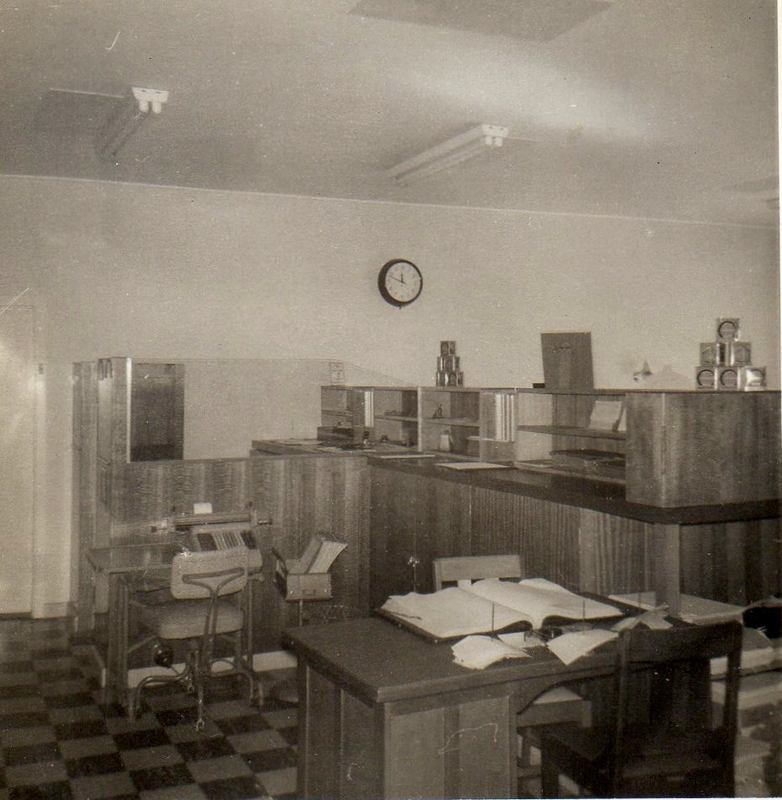 Kerry Bridge responded with another two scanned photos: 1-the old branch in 1960 and 5-the Manager's Office 1960. He added "The photos that David Jobson sent on to you were some old black and whites that I found and scanned into my computer photo album. They were sent in response to his photo of the old branch as it was when he travelled through recently. Unfortunately they are the best I can offer you. Attached are couple more for your archives. The Branch Manager was Neville Frost (?). 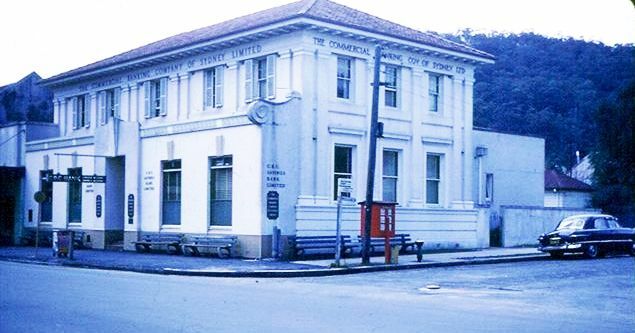 The old branch premises were dubbed “temporary” when I arrived there in 1960. It consisted of two rooms divided by a corridor. The Manager’s office on one side and the branch on the other. The ceilings were timber and had so much dust in the ceiling that the worst hazard we had was trickling dust between the gaps whenever the was a breeze. I believe it was an old stock and station agents before the Bank utilized it. Both the old and the new branches were handy for the staff as we lived in the pub. The Teller Accountant (John Hodgson(?) and the Ledgerkeeper/Junior (Me) shared a room. The old branch was attached to the pub and the new was about twenty metres away around the corner. 1968 photo taken on day of demolition in Current Accounts July 1969. 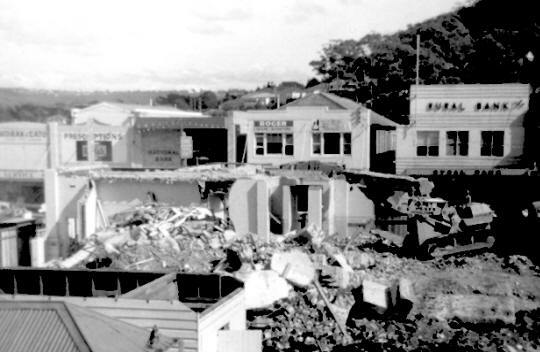 1968 Photo of branch on day of demolition in Current Accounts Jan 69. 1968 Photo by Jon Blissett of demolition. 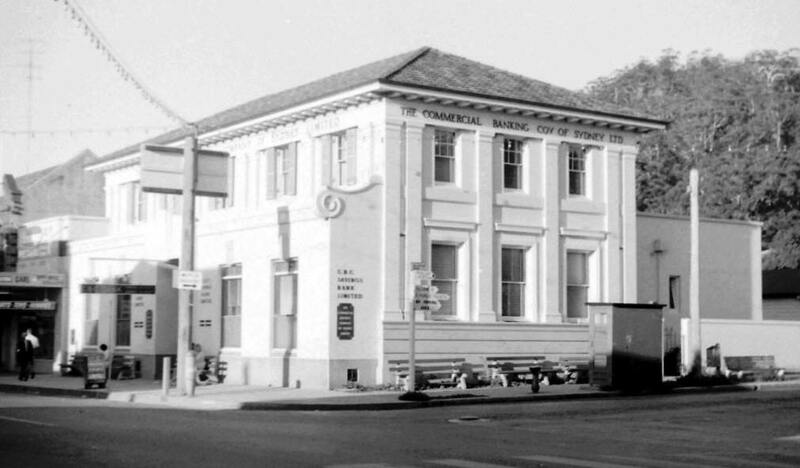 (J. Ness undertook a methods study in State Bank across the road around 1985). 2012 December Kevin Ryan supplied photos of Gosford and East Gosford from when he worked here. 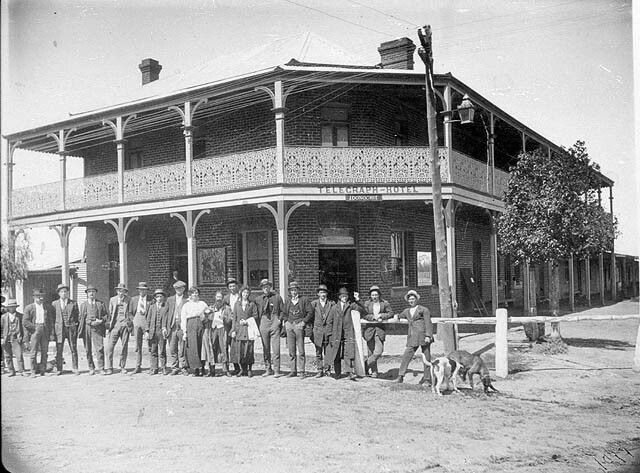 2019 In the early days of banking in Australia, it was common for banks to authorise persons in country areas to act as their agent. Generally the agent did no more than discount bills, mostly promissory notes, on behalf of the bank, retaining an agreed percentage of the discount, as his commission. He was not on the bank's payroll, nor did he operate on bank premises. 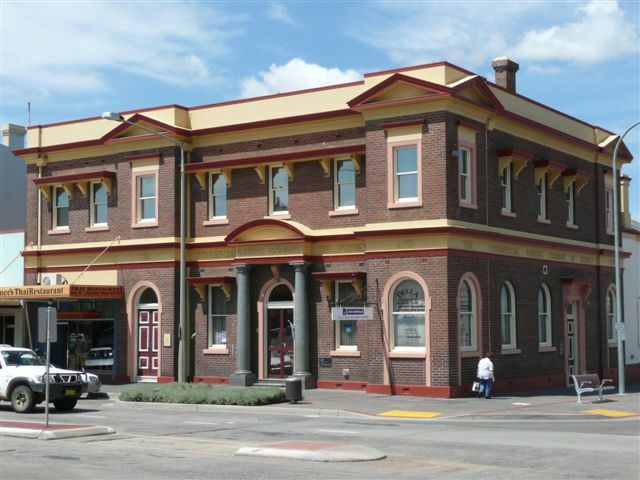 1837 The Bank established an agency in Goulburn with John O'Sullivan as its agent. 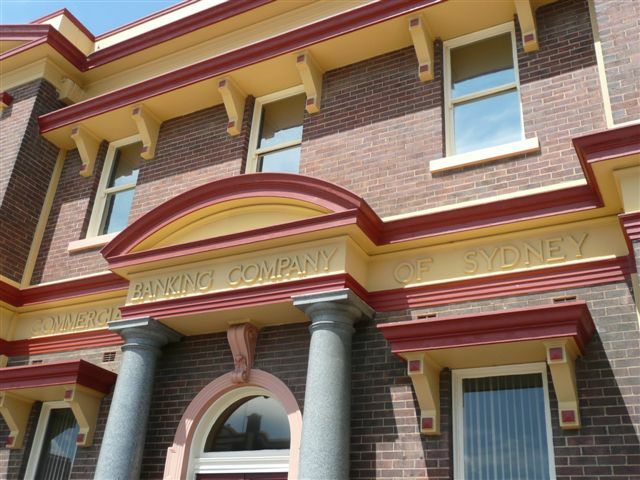 1842/4 During the Depression the Goulburn Agency was closed, but Mr O'Sullivan carried on as a private banker and an agent for CBC. Geoff Chapman states: I do not know what to make of Notices appearing 12 months apart It looks like they night have given 12 months notice of closure of the Branches. 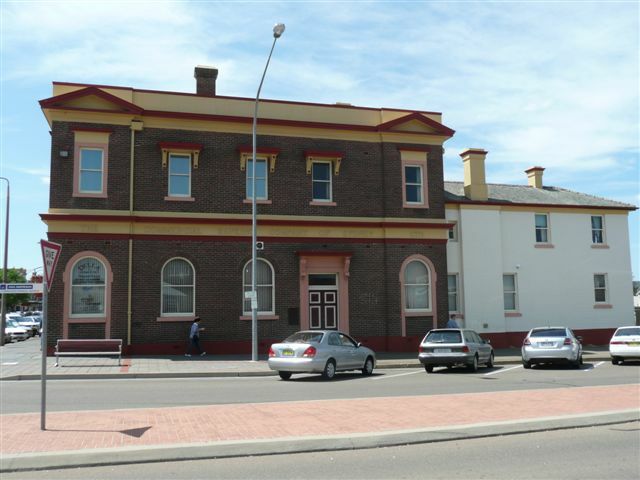 1853 The bank reopened in Goulburn with Mr O'Sullivan in charge but still designated "an agent"
1858 In November the Board agreed to O'Sullivan taking leave of absence and sent Mr Page, an officer of the Bank, to relieve him. At that time the Agent apparently had on his staff a teller and a ledgerkeeper who were officers of the bank. Some time after his return from leave, Mr O'Sullivan was appointed Manager at Goulburn (all from Current Acounts July 1962). 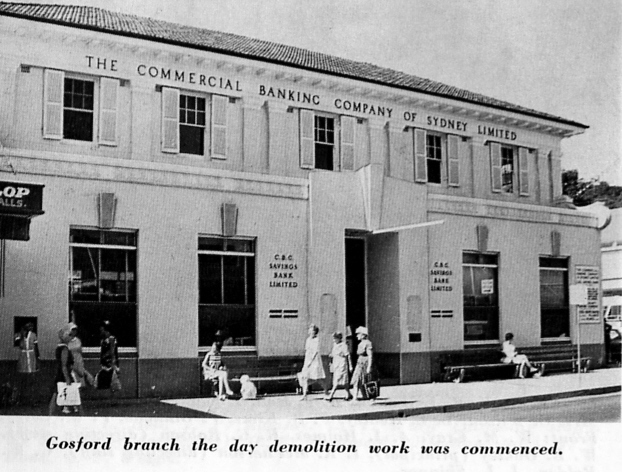 Mr. S.A. FOX, of Goulburn, acting manager of the local branch of the Commercial Bank of Sydney, accidentally shot himself through the chest with a revolver when cleaning it yesterday, and he died this morning from the effects of the wound. " 1960 photo by Bill Morelli. 2008 photos by David Jobson. Goulburn branch photographed 17 October 2008. 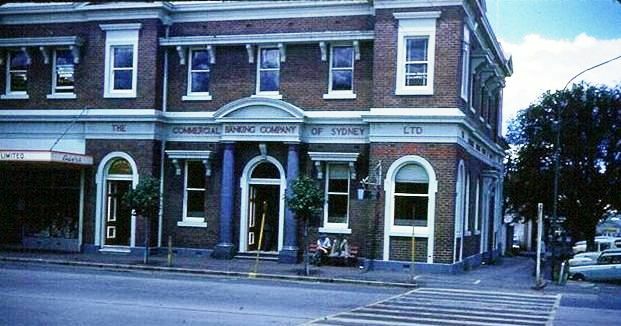 A really nice building with beautiful raised "Commercial Banking Company of Sydney Limited" lettering. 2013 March photos by John Ness. 1. The name of the restaurant in the left section has changed. Occupied by Della & Associates, financial services. 2. NAB moved a couple of blocks to the left in the Mechanics Institute building. 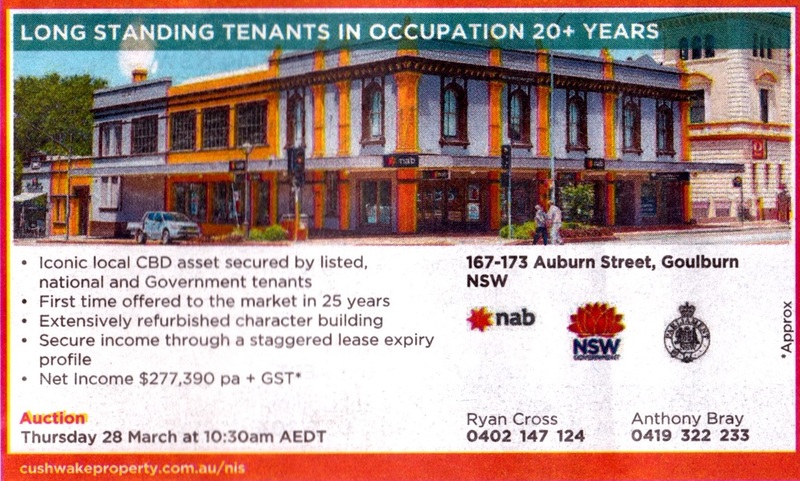 2019 February Mechanics Institute building for sale with NAB tenant of 20 years occupancy.